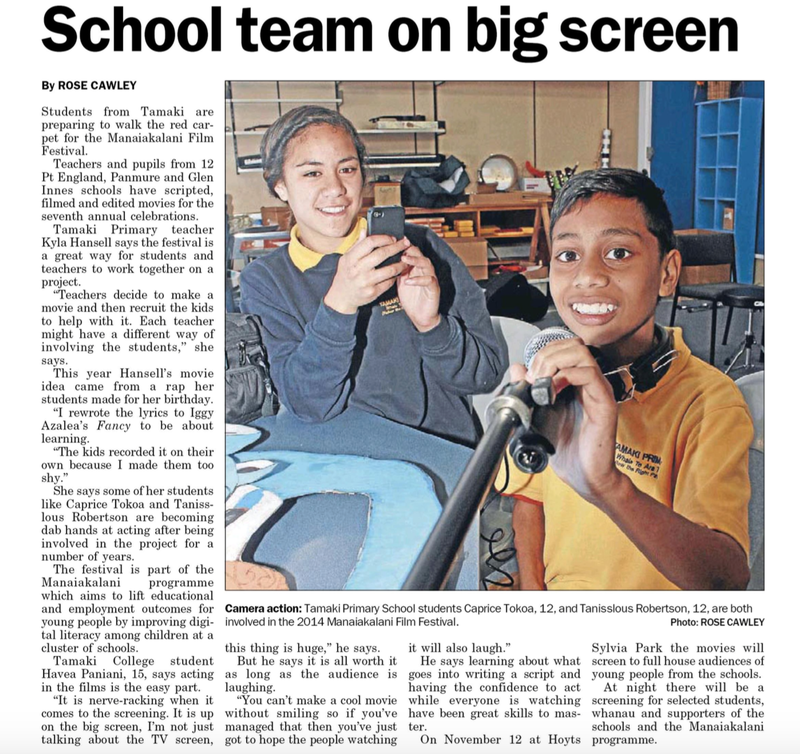 In an article for Fairfax Media's East and Bays Courier, Rose Cawley talks about Tamaki Primary School and the Manaiakalani Film Festival. To read the full article click here or click the image below. To see videos from the 2014 Manaiakalani Film Festival, click here. 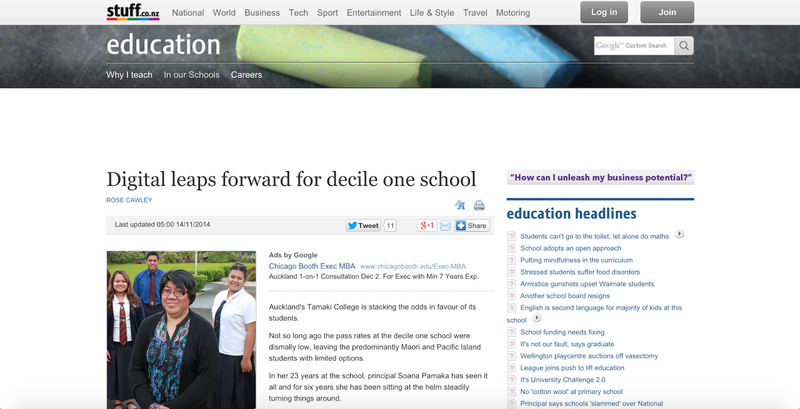 Tamaki College has been written about in an article for Stuff.co.nz by Rose Cawley. The article looks at the progress being made in raising student achievement, and talks about initiatives that are helping to boost outcomes, including Manaiakalani. 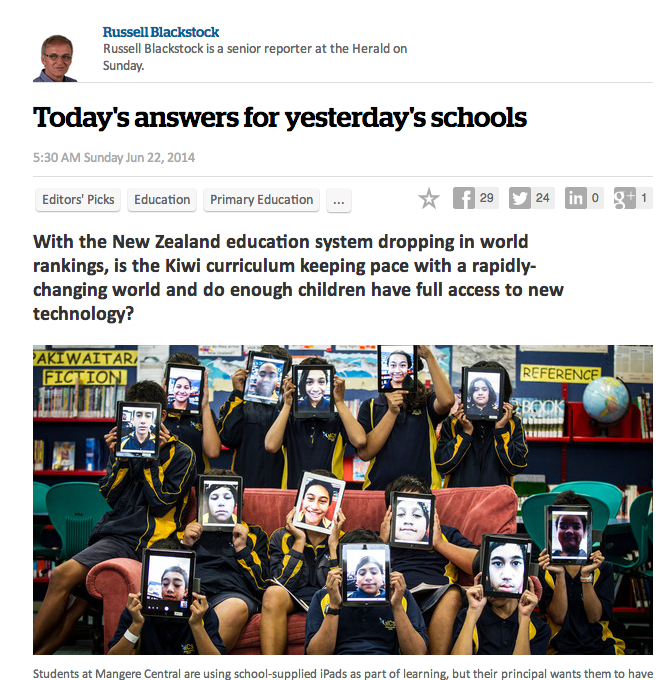 As part of an opinion piece about school decile ratings, Pete from the WhaleOil blog mentions Manaiakalani, praising the use of digital teaching to empower our learners. He also talks about how impressed he was by the Manaiakalani Film Festival, which was held last week. To see all the videos from the Manaiakalani Film Festival click here. For the second year in a row one of our own Manaiakalani kids has been mixing with some big names in New Zealand to raise money for kids who need a hand up to acquire technology. 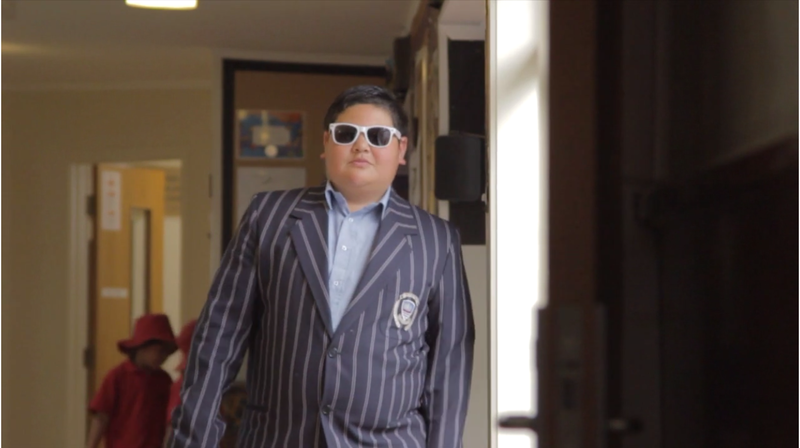 Tamaki college student Nathaniel Tuia does a stellar job of presenting this funny and engaging film that played at The Warehouse Supplier Awards dinner 2013.The charity recipient was Variety’s Laptops for Learning programme. The film tells us why it’s essential to get technology into the hands of poorer kiwi kids and inspires the audience to give generously. The recent announcement by Telecom that they are continuing the support of the Manaiakalani programme was welcomed by the twelve Manaiakalani schools and their whanau. The Telecom Foundation announced today significant additional funding to support the rollout of the Manaiakalani digital learning approach to more low income communities. Today’s announcement confirms an additional $1.2 million contribution over two years to the Manaiakalani Education Trust, to support pilot digital learning programmes in several new school clusters across New Zealand. The Telecom Foundation is approaching its third year of partnership with the Trust, with an original investment of $1 million over four years. 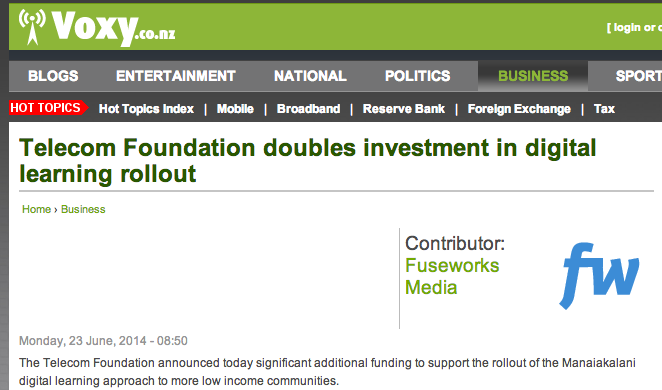 The new funding will more than double this investment to $2.2 million. The Manaiakalani Innovative Teachers (2014) are pleased to partner with the Telecom Foundation for the launch of their new name, Spark. You will enjoy hearing about our journey in this engaging short video. 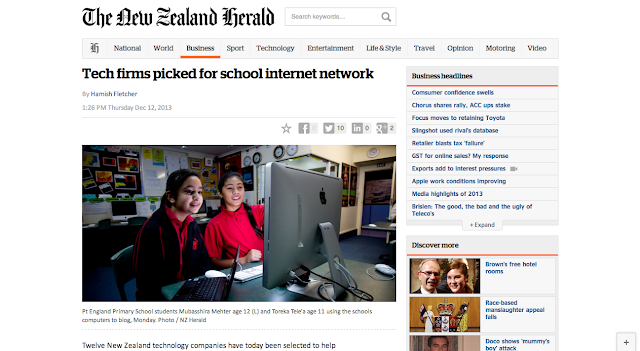 Last weekend the NZ Herald ran an article questioning whether our schools in New Zealand are keeping pace with current technology. The Manaiakalani Programme was quoted as an example of a group of schools ensuring that our young people do get to learn using the technology of today. Glenbrae School's principal, Lesley Elia was also interviewed and spoke about the impact of the Manaiakalani Programme in her school. This is an idea adopted by a dozen Auckland schools, which have signed up to the Manaiakalani Education Programme. This promotes new teaching and learning approaches in a growing cluster of decile 1 schools in the low-income communities of Tamaki — the East Auckland suburbs of Glen Innes, Panmure and Pt England. Glenbrae School in Glen Innes is part of this programme. Parents can pay for netbooks in instalments, equivalent to less than the price of a cup of coffee per week. For about $3.50 a week, the computer can be bought over three years. The price includes internet access from home and technical support. Glenbrae principal Lesley Elia says another benefit is that teachers' job are made easier because the devices are all the same. "We have also had huge support from Telecom, which has helped a great deal. "These devices are vital and without the Manaiakalani Trust we would never have enough money to cover something like this." The Government was looking at the initiative with a view to introducing it throughout the country. "Principals at schools in other regions are now coming to take a look at what we are doing." The Manaiakalani Cluster has been working with the Learning and Change Networks to support schools around New Zealand. They have made this video to give an overview of what is being achieved in the LCN schools. At 1:07 we see Stonefields School featured and at 3:07 a brief glimpse of how Manaiakalani is actively supporting the Kaikohe Cluster in the far north. Learning and Change Networks New Zealand from Learning and Change Networks on Vimeo. What is Learning and Change Networks? A group of schools/kura and communities working together to grow capability and to accelerate achievement of priority learners in ways that recognise cultural diversity and that grows innovative and effective 21st century learning environments. Manaiakalani has been supporting a cluster of schools in the Mt Roskill area - Ako Hiko - to follow a similar journey to the one we are on. This weekend TV One featured Wesley Intermediate and the Ako Hiko cluster on the news and mention was made of Manaiakalani during the item. 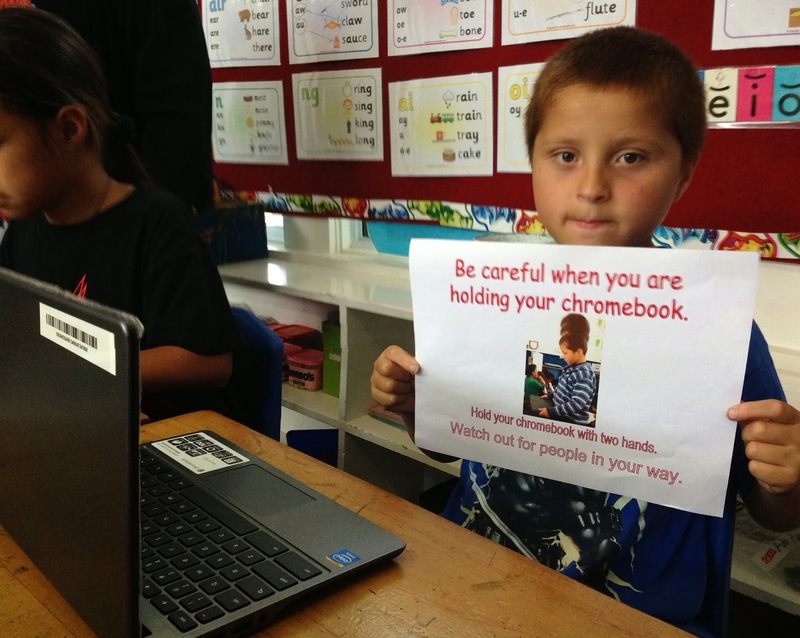 The Manaiakalani schools have been supporters of three schools in the Kaikohekohe area over the last year and were very pleased to hear news of their Chromebook rollout day in February. This article gives some insight into the journey of Ohaeawai School, Tautoro School and Kaikohe West School. 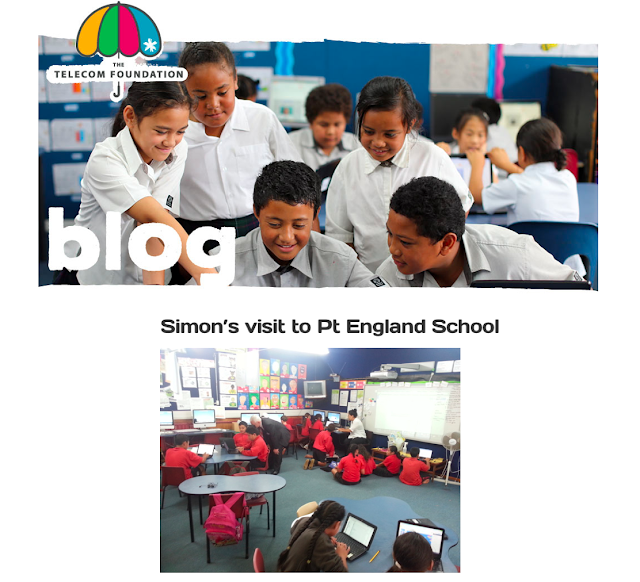 We have hosted their teachers in our schools and worked with their principals and lead teachers from time to time in Auckland. Richard Johnston (Panmure Bridge School) , Helen King (Pt England School), Jenny Oxley (Manaiakalani Education Trust) and Dorothy Burt (Manaiakalani Education Programme) have at different times travelled to Kaikohe to provide support. "We have recently developed a post-graduate programme with the Manaiakalani schools in Tamaki to support the digital learning, community-based programmes they have developed across their cluster. Each of these initiatives requires the university to work differently and flexibly - to itself be humble about that fact that we learn as much from working with teachers as they learn from us and that together we will advance knowledge." 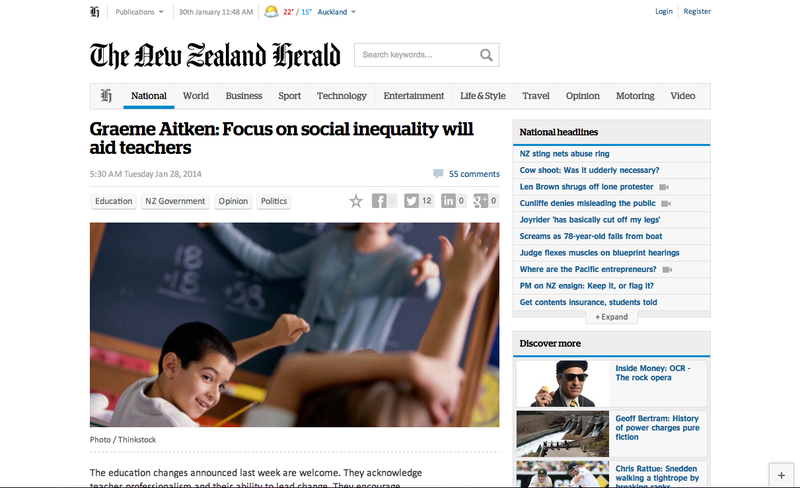 Manaiakalani has been featured in an article by Andrew Patterson in the New Zealand Herald. The article examines the programme's influence on schools in the Manaiakalani cluster and how the Manaiakalani Digital Teacher Academy aims to end up helping more communities to create full immersion digital learning environments. The Telecom Foundation have announced that they are funding digital teaching for more communities, after the success of Manaiakalani programme. Paul Brislen talks about a the changing face of education in New Zealand through digital teaching, with a focus on Manaiakalani Education Trust. 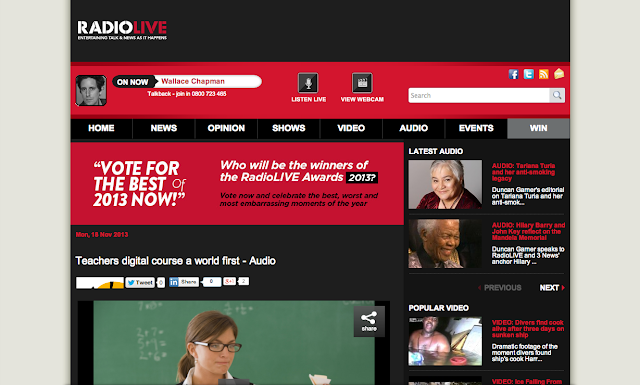 Andrew Patterson interviews Dorothy Burt about the newly launched Manaiakalani Digital Teacher Academy. Click the link below to listen to the interview. 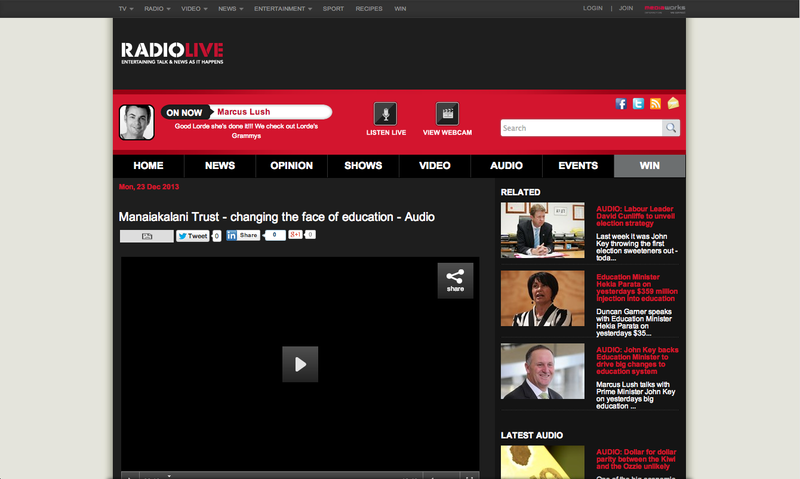 Te Karere has released a news story that looks at the Manaiakalani Education Trust's new Digital Teacher Academy.